If there’s one versatile vegetable you can rely on year-round, it’s the sweet potato. Not only does it work in the same applications you’d use a regular potato – like sweet potato chips and fries, mashed sweet potatoes, and sweet potato hash – but it also works well in healthy desserts, can be used as a pasta filling, and even blends into a tasty smoothie. The bottom line is this tuber is not only tastes great, but it’s great for your body too. 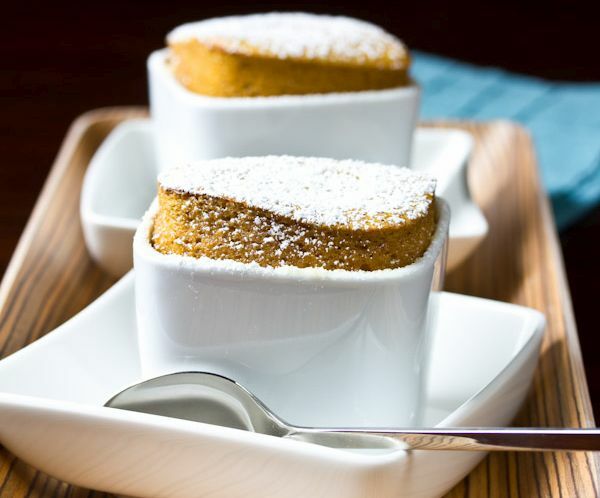 Transform sweet potatoes into a dish that truly wows with a soufflé. And you won’t believe the macros on this dessert! There are less than 150 calories per serving, which is awesome enough. Then consider there are only 7 grams of sugar, including some from the sweet potatoes, and this is one light, fluffy treat worth whipping up whenever you have the time. 1. Preheat the oven to 400°F, and set the rack in the center of the oven. Butter and sugar 6 eight-ounce ramekins, and set them on a cookie sheet. 2. Place the milk, pumpkin pie spice, egg yolks, flour, salt, and baked sweet potato in a blender. Blend on high until completely smooth. Then pour the mixture into a bowl. 3. Rinse the blender jar with soapy water, and dry thoroughly. Then place the egg whites, sugar, and cornstarch in the blender. Process on a low setting until very frothy. 4. Pour the frothy egg whites over the sweet potato mixture, and fold in. Divide evenly among the prepared ramekins, and bake for approximately 25–30 minutes, until they rise high above the ramekins. 5. Remove soufflés from the oven, and dust with powdered sugar. Serve immediately. 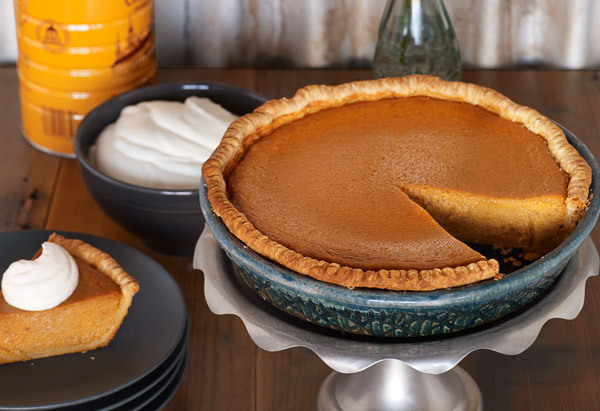 When occasion calls for a pie – whether it’s Thanksgiving, Christmas, Pi Day, or any time a serious craving hits – eating more than one slice tends to be guilt-inducing. That’s why there’s light sweet potato pie to enjoy the best of both worlds. Because the pie filling is light on the butter and sugar, it’s not too sinful even with a traditional pie crust, and you can get even richer flavor and texture from crust with coconut and whole oats, as below. 1. Preheat the oven to 425°F. Boil sweet potato whole in skin for 50–55 minutes, or until soft. 2. Meanwhile, mix together the crust in a medium bowl. Combine oats, flour, and coconut. Stir in the vegetable oil and water. Press dough into a 9-inch pie pan. Bake in preheated oven for 12 minutes, until lightly browned. 3. Skin the sweet potato when cooked by running it under cold water. Blend potatoes in a blender, and pulse for about one minute to remove all the fibers. 4. Place sweet potatoes in a bowl. Add browned butter, and mix well. Using an electric mixer, beat in the sugar, milk, eggs, cinnamon, and vanilla. Beat on medium speed until mixture is smooth. Pour filling into the parbaked pie crust. 5. Bake at 350°F for 55–60 minutes, or until a knife inserted in the center comes out clean. Serve with coconut whipped cream. Even when they’re studded with luscious-looking fruit, most muffins available on-the-go are full of fat or contain too many calories. These sweet potato muffins are as satisfying as the bakery or café variety, but they’re unbelievably healthy and light on the calories. 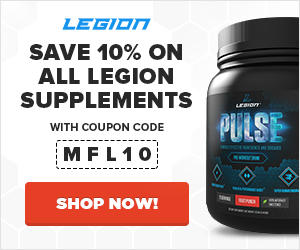 For more protein, replace one cup of flour with your favorite unflavored or vanilla protein powder. 1. Preheat the oven to 400°F. Grease each cup of a standard 12-cup muffin tin, and set aside. 2. In a large bowl, combine flour, baking powder, salt, cinnamon, ginger, nutmeg, and cloves. Set aside. 3. In a separate bowl, mix together the yogurt, egg, honey, coconut oil, and sweet potato puree. Beat until smooth. 4. Make a well in the center of the dry ingredients, and pour in the wet mixture. Stir them together, being careful not to over-stir. Gently fold in the chopped apples. 5. In a small bowl, stir together the packed brown sugar, pecan pieces, and melted butter to make the streusel. 6. Fill the prepared muffin tin cups 2/3 full. 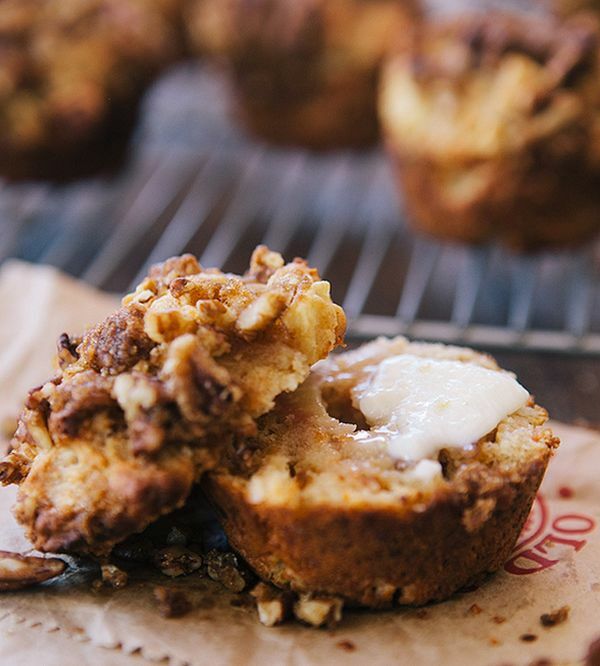 Sprinkle each muffin with a heaping teaspoon of streusel topping. Bake for 15 to 20 minutes, or until muffins are golden and spring back when touched. Cool on a wire rack for several minutes, and serve warm. When you think of asweet potato salad, you probably get images of picnic fare slathered in mayo. Here’s a healthier twist, with lime juice and chili powder to give a robust flavor and the addition of quinoa to make the sweet potato base even more nutritious. This salad is incredibly easy to throw together, and it works as a vegetarian entrée or all-encompassing side dish. 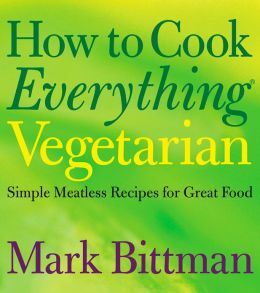 For other recipes as simple and delicious as this one, I recommend How to Cook Everything Vegetarian by Mark Bittman. 1. Peel the sweet potato, and dice into half-inch or smaller pieces. Boil a pot of salted water, and cook the sweet potato covered until tender, about 15 minutes. Drain well. 2. Toss together the sweet potato, quinoa, bell pepper, avocado, and red onion. Mix in the cayenne or chili powder. Sprinkle with salt and pepper to taste. 3. Whisk the oil and lime juice together, and toss the salad with about half of this mixture. Add some or all of the rest to taste. Adjust the seasoning as desired. Garnish with cilantro and toasted pepitas, and serve. Pasta is a blank slate for whatever sauce, meat, and veggies you want to have for dinner. 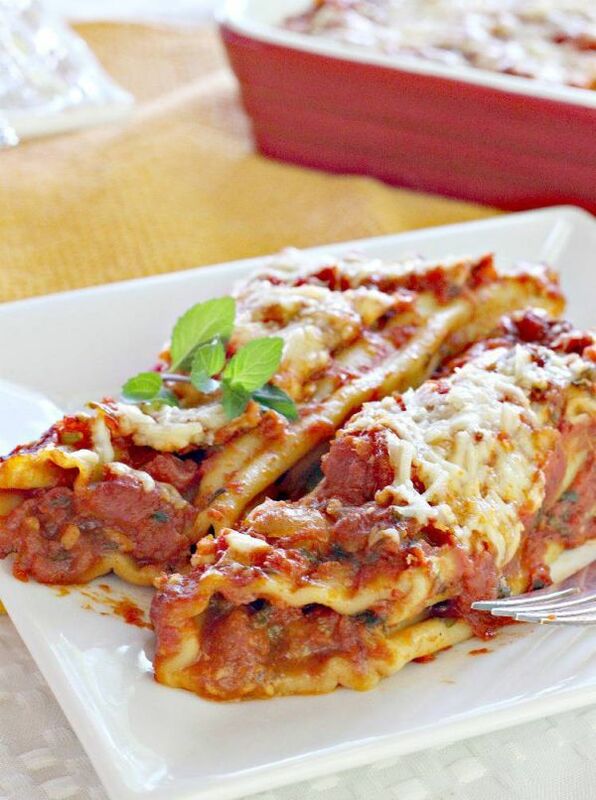 But while other types of noodles have enjoyed unique flavor pairings – like pumpkin lasagna and strawberry spaghetti – manicotti is usually filled with ground meat or plain ricotta. This recipe makes a classic home-cooked meal feel new and even more nutritious with a sweet potato filling and, if you’re up for it, from-scratch manicotti noodles. 1. Start by making the pasta. Put the flour into a bowl, followed by the eggs, olive oil, and salt. Use a fork to whisk the eggs with the oil and salt, slowly incorporating the flour. When it comes together and a good amount of the flour is mixed with the eggs, start using your hands and bring the dough together, only incorporating as much flour as the dough seems to need and want. Once you have a uniform dough and most of the flour is in the dough, wrap it in plastic and let it rest for 15 minutes. 2. Put a decent couple glugs of olive oil into a sauce pan and simmer the onions for about 10 minutes. Add in the garlic, salt, pepper, and chili flake and cook another 2 minutes. Add in the can of tomatoes and oregano and simmer for 15 minutes. Remove from heat. 3. Mix together the mashed sweet potato, chopped basil, ricotta, eggs, and salt to make the filling. Stir in the mozzarella too, leaving some to the side for the top. 4. Roll out your pasta dough to the second thinnest setting on your pasta maker. Cut the dough into large squares that will fit nicely into the baking dish you are using. Dip the squares 2 by 2 into boiling water for about 2 minutes and remove. Lay the cooked noodle onto a plate or cutting board, and add a nice scoop of filling. Roll the pasta around the filling and place seam side down into a baking dish that already has some of the sauce on the bottom. 5. Preheat the oven to 350°F. Repeat the assembly steps until you have made about 12 of the manicotti and used all the filling. Top with remaining sauce and mozzarella, and bake for 30 minutes. If needed to brown the top, give it a little extra time under the broiler. This smoothie is velvety thanks to avocado, banana, and almond butter, and it has natural sweetness from dates and sweet potato. 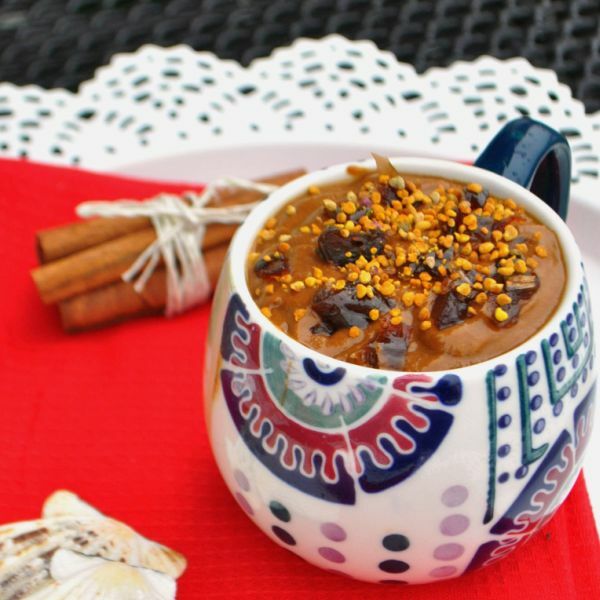 Mix in chocolate protein powder, a few drops of vanilla extract, and cinnamon, and you have a concoction that’s great for breakfast or post-workout replenishment. For even more flavor, top with goji berries and coconut flakes. 1. Chop the sweet potato, bananas, and avocado into big pieces. 2. Add all ingredients to a high-powered blender, and process until creamy and completely smooth. Most recipes for sweet potato bread are similar to pumpkin, banana, and zucchini – in other words, a loaf that’s similar to a muffin. But sweet potatoes can sneak into other breads and baked goods too, like this focaccia. It makes a delicious dinner addition, but it can also be used to make a hearty sandwich. 1. In large bowl of electric mixer or work-bowl of food processor fitted with steel blade, mix or pulse yeast, 1/2 cup flour, and 1/2 cup warm water until combined. Cover tightly with plastic wrap (or put work-bowl lid on) and set aside until bubbly, about 20 minutes. Add remaining dough ingredients, including sweet potato. If using mixer, fit with paddle attachment and mix on low speed until dough comes together. Switch to dough hook attachment and increase speed to medium; continue kneading until dough is smooth and elastic, about 5 minutes. For food processor, process until dough is smooth and elastic, about 40 seconds. 2. Transfer dough to lightly oiled bowl, turn to coat with oil, and cover tightly with plastic wrap. Let rise in warm, draft-free area until dough is puffy and doubled in volume, about 1 hour. 3. With wet hands (to prevent sticking), press dough flat into generously oiled 15 1/2-by-10 1/2-inch jelly roll pan or halve and flatten each piece of dough into 8-inch round on large (at least 18″ long), generously oiled baking sheet. Cover dough with lightly greased or oil-sprayed plastic wrap; let rise in warm, draft-free area until dough is puffy and doubled in volume, 45 minutes to 1 hour. 4. Meanwhile, adjust oven rack to lower-middle position and heat oven to 425°F. With two wet fingers, dimple risen dough. For the topping: Drizzle dough with oil and sprinkle evenly with rosemary and coarse salt, landing some in pools of oil. 5. Bake until focaccia bottom is golden brown and crisp, 23–25 minutes. Transfer to wire rack to cool slightly. 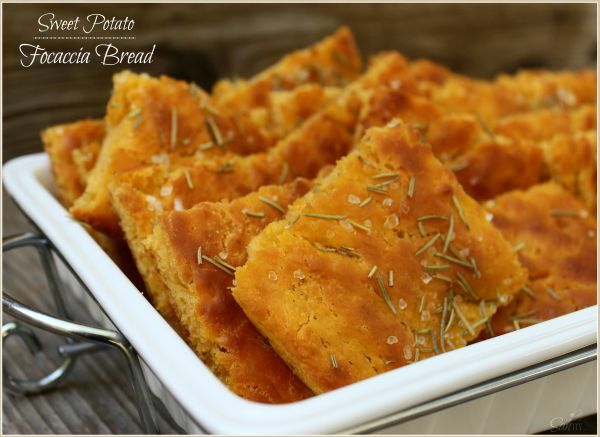 Cut rectangular focaccia into squares or round focaccia into wedges; serve warm. Can store on counter for several hours and reheated just before serving. Or, wrap cooled focaccia in plastic and then foil and freeze for up to 1 month; unwrap and defrost in 325-degree oven until soft, about 15 minutes. 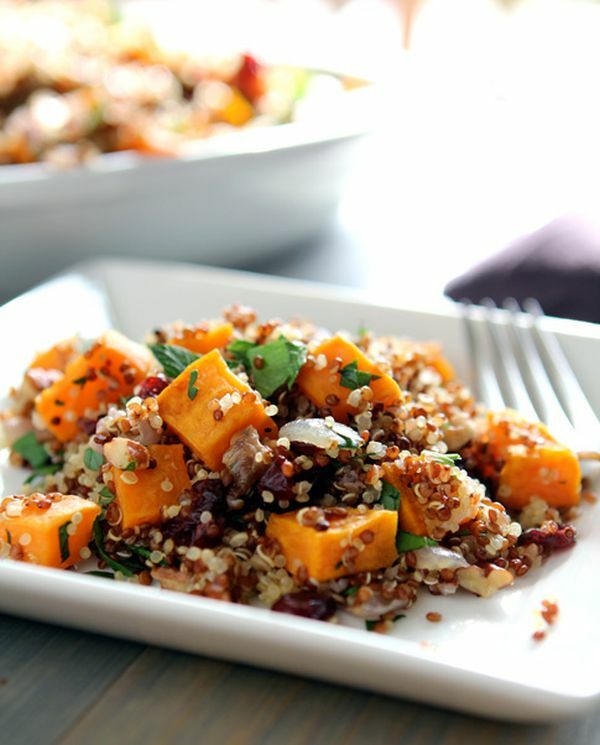 What did you think of these healthy sweet potato recipes? Have anything else to share? Let me know in the comments below!